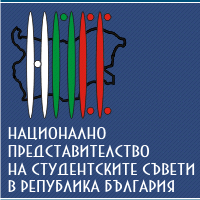 The National assembly of students’ councils founded in March 2000 in city of Svishtov, in concordance with Bulgarian laws on Higher Education. Since then NASC has 51 student councils, as many as the amount of legitimate universities in Bulgaria. That is why NASC is the only legal organization representing about 250 000 Bulgarian students. Every university has an official delegate who is part of the general assembly. Our central office is downtown Sofia, located in the National student house just infront of the Bulgarian Parliament.